Coal Mine Theatre engages under the terms of the INDIE 2.2, professional Artists who are members of Canadian Actors’ Equity Association. 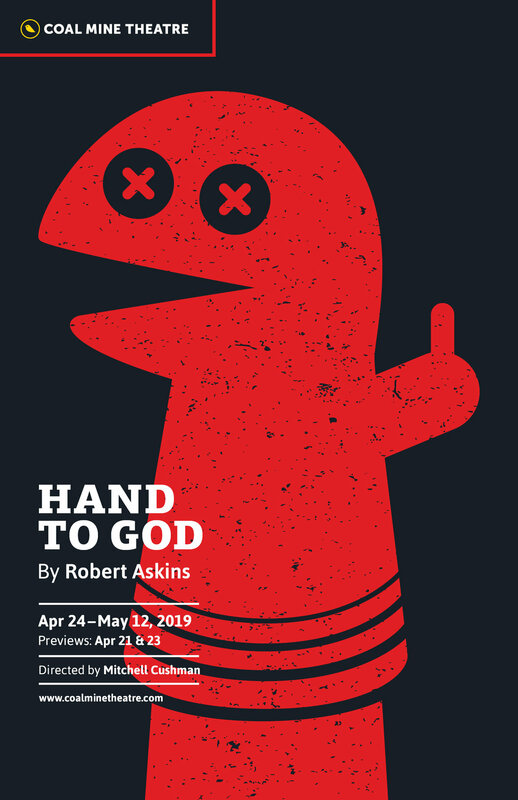 HAND TO GOD, a blasphemous black comedy, with puppets, written by Robert Askins, was the most produced play in the 2016-17 American theatre season with 13 productions staged across the country. (Says a lot about the state of the States!) Mitchell Cushman (The Aliens) returns to the Coal Mine to revisit a play about a satanic sock puppet he directed at the Royal Manitoba Theatre Centre in 2017. In a quiet Texas town, recently widowed Margery is tasked with running the church puppet club. Attended grudgingly by her teenage son Jason, he finds solace in Tyrone, his homemade puppet. That is until Tyrone turns fiendish causing doors to slam, lightbulbs to burst and his head to spin around Exorcist-style. Is it...the devil? HAND TO GOD tackles all the big themes: death, depression, alcoholism, sexual repression, emotional guilt, religious hypocrisy and crafting.